Twitter has quietly opened up its various analytics tools to the public, giving everyone access to in-depth data about the people and brands who follow them, as well as the performance of their most recent tweets. The change was spotted by Christopher Penn, vice president of marketing technology at SHIFT Communications earlier this week, as well as Danny Olson, a digital strategist at Weber Shandwick. Users simply need to head to the Twitter Ads dashboard and click on the ‘Analytics’ tab at the top of the page to access the new features. 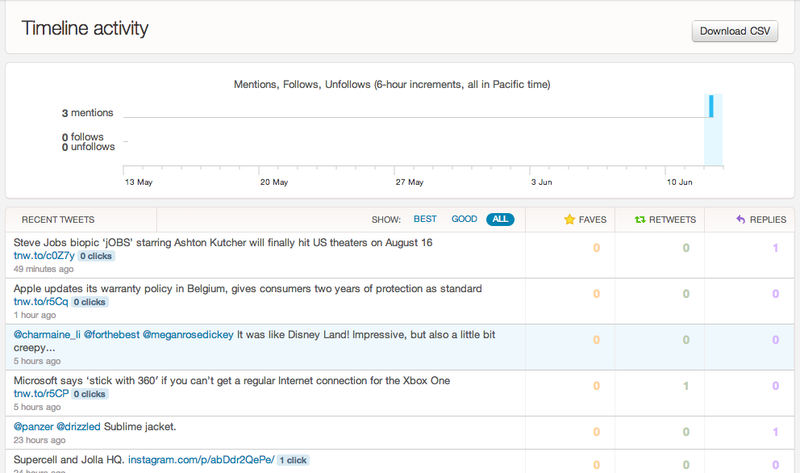 The Timeline activity displays a graph for the user based on the number of mentions, follows and unfollows that they’ve received over the last month. A detailed list underneath shows all of the user’s most recent tweets, including the number of times someone has favorited, retweeted or replied to it. All of the information is shown in a clear and accessible format so that every user, regardless of whether they’re the marketing manager of an international conglomerate or an emerging blogger with just a handful of followers, can analyze and take action based on the data. Most notably, this list also shows the number of times that someone has clicked on the link contained in a tweet – an easy way to gauge referrals from one of the largest and most influential social networks on the Web. There’s even the ability to download a CSV file of the data for the user’s own personal records. Until now, the advertising dashboard for Twitter has been aimed primarily at businesses who want to pay to display their tweets in front of a specific audience. Coupled with the ability to promote the user’s account, it’s an obvious and lucrative way for Twitter to monetize its service. Media behemoth and gloval advertising company WPP announced a ‘global strategic partnership’ with Twitter earlier this month. The deal will mean that WPP can combine its own analytics, targeting and creative capabilities with those offered by Twitter. That means more effective campaigns for its clients and more exposure for the Twitter platform. It follows 11 new services that joined its Certified Products Program in May, as well as the formal launch of Twitter Amplify, a new program that gives brands and broadcasters the opportunity to publish real-time, in-tweet video clips to their followers. Perhaps more importantly, in April Twitter opened up its self-serve ad platform to all users in the United States. Today’s update means that users can now also leverage the platform to track the popularity and performance of their tweets. An invaluable tool for anyone with even the slightest interest in data analytics. TNW reached out to Twitter, but didn’t receive a response.